Dr. Carl Curtis was born and rasied in South Louisiana in the small town of Rayne. 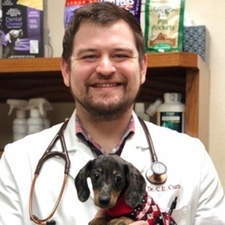 He graduated with his Baccalaureate in Biology from the University of Louisiana at Lafayette and his doctorate of Veterinary Medicine from the Louisiana State University. 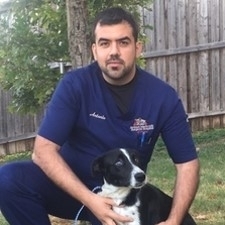 He spent the beginning of his career working at a small animal clinic in Athens, Texas. He has special interests in surgery, radiology, ultrasonogaphy, and clinical pathology. He and his wife are happy to be in Frisco and be a part of the AMSH team. He enjoys hunting, fishing, football, working on classic cars, trucks, motorcycles, and hiking with his wife Courtney and his dog "Ford". He is the proud father of his new born son named John Ross Curtis. He also has two cats "June" & "Riley". Nancy is a native of Oklahoma and joined the AMSH team in March of 2016. She graduated with a Bachelor of Science Degree from East Central University, Ada Ok in 1999, along with an Associate's Degree in Applied Science from Murray State in Tishomingo, Ok in 2000. 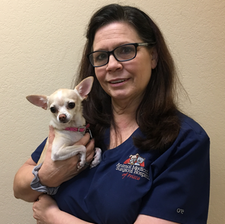 Nancy has 15 years of management experience ranging from managing her father's Quarter horse ranch in her early days and then moving to management in the dental and health care fields. Being raised on a horse ranch she has been around small animals, livestock, and of course horses her whole life. She continues to be involved in horses, currently owning three, with a two year old barrel prospect in training. She also has two dogs Molly and Mo that are her constant sidekicks. She is the proud mom of two children Brendon (23) and Brittney (19). She enjoys swimming, skiing and grilling out. She can be found most weekends working cattle, mowing, riding horses or attending her daughter's horse events. Dr. Job Gonzalez has joined us from Mexico City. He obtained his veterinary degree from UNAM in 2002. Job's interests include general and orthopedic surgery. He is currently working as our surgical technician while he brushes up on his English and works to validate his credentials in the US. He is married with three wonderful children whom he enjoys spending his free time with. Patty has been working as a technician for over a decade. She is extremely dedicated to this profession and is our official "cat whisperer". Patty has a very vast knowledge about all animals but she loves to deal with exotics, reptiles, and generally any creepy crawlies that most people shy away from. She lives with her husband and an army of critters. Her cats are, Mingus, Mason and Turtle all of whom terrorize the two dogs Sachel and Sheila and then there is her snake Sundae who watches and laughs at the whole thing from the safety of his terrarium. Patty is our official "Cat whisperer"
Erin started at AMSH in July 2016. 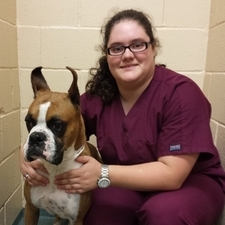 Erin attended Cedar Valley College, where she completed their Veterinary Technology program in 2012. 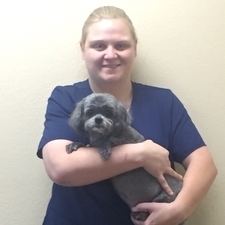 She has over 6 years experience as a veterinary technician. 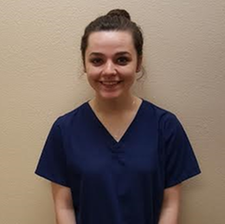 Erin is currently working on taking her state and national boards to become a licensed technician. Erin hopes to one day work at a Zoo. Erin has a Great Pyrenees mix named Samson, a yellow lab named Nala, and a leopard gecko named Luna. Alex joined the team at AMSH in spring 2016. 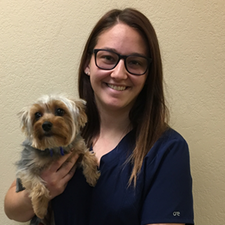 Alex completed the Collin County Vet Program is now a Certified Vet Technician (CVT) and attending college to pursue a career in veterinary medicine. She now the liazon for the any interns that come to us from Collin County Vet Program. Alex has a Shih Tzu "Cocoa" who she has had for 11 years! Graduated from the University of Texas at Austin with a bachelors of Science in Psychology. She has two dogs, a german shepherd named Grayson, and a blacl lab Named Sahara. Jasmine loves reading, playing volleball and finding new places to eat. Hopes to persue a degree in veterinary medicine. Graduated from the University of Texas, Austin. Currently working on becomog a Certified Veternarian Technicin. (CVT). Dr. Antonio Garza joined AMSH in the summer of 2016. He is originally from Monterrey, Mexico. He obtained his Veternarian degree from CEU in 2013. 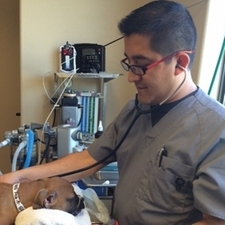 He is currently working as a vet technician while learning English and plans to validate is credentials in the US. He enjoys spending time with his animals at his ranch in Mexico where he raises and sells sheep. In his free time he enjoys playing football and is a big fan of the Denver Broncos. Over 6 years experience in the Veterinary field. Shea joined the AMSH team in November 2016. She has a 4 year old son. Shea took 4 years of small and large animal science through high school as well as equine science. Shea showed lambs for 3 years of high school and was in FFA for all 4 years. She also has five dogs "Paisley", "Tank", "Sadie", "Roscoe", "Whiskey", along with many cows and horses. In her free time Shea likes camping, hunting, hiking, horseback riding or being out at the ranch working cattle. Kylie joined AMSH in Febuary 2018. She was born and raised in Denton, Texas & graduated from Allen High School in 2013. She participated in track during her Jr & Sr year. She's loves going to sporting events and doesn't care who wins as long as she gets a hot dog, she's happy. Shes loves spending time with her Pit Mix Lacy & her cat Sucre. furry families. She and her husband are avid gamers. She also has three cats, Sprite, Ash, & Mirri, the senior citizen at 18 years old. Bela joined the AMSH family at the end of March 2018. Bela is a recent graduate of Centennial High School, where she played on the soccer team. She was a part of the FFA program and participated in the Veterinary Medicine & Agricultural Advocency team for several years. In her free time Bela loves to spend time with her English Bulldog Spike, and her Boston Terrier, Max. She also has an interest in traveling with her family and eating at new resurants with he friends. Bela plans to attend Collin Community College for the first few years and will then transfer to Texas A & M where she plans to pursue a degree in Veterinary Medicine. 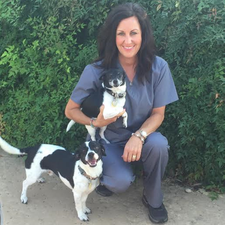 Terri is in charge of making sure all of your pets look their best. She has been grooming pets since 1985 and working as a groomer for veterinarians since 1986. Terri has two sons who are grown and have families of their own. In her spare time Terri loves to cook and go to the movies. Her family also includes 5 dogs and 2 cats. Mike joined the AMSH team in May 2017. 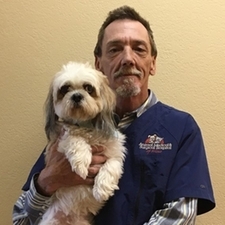 Mike has been in the dog care field for over a decade. He has three dogs at home, Gigi, Spike and Harley. Mike's life revolves around their well-being. Mike does an extraordinary job of caring for the hospital's boarding animals. Over a decade in the dog care field. Cynthia started in our internship program fall 2016 and later joined our AMSH staff here in January. She plans to attend Texas A&M in the fall where she hopes to gain her degree in Biomedicine. Cynthia has an 11 year old Yorkie-Mix named Oscar, a pink Betta fish named Prometheus. She moved here from Montreal, Canada where she learned her third language, which include English, Spanish and French. 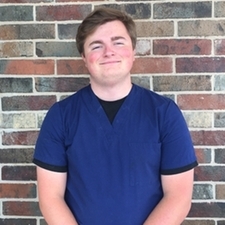 Brandon completed the Frisco Vet Program and will attending Oklahoma State University in the fall to pursue a degree in Animal Science. Brandon has had small animals his whole life throughout high school along with raising pigs & rabbits for FFA. Brandon has an English Setter named Ducky & a cat named Maggie. 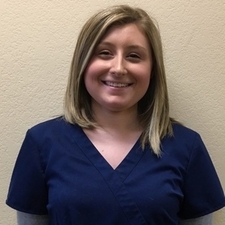 Sydni was in the Intern Program through the CTE Center from August 2017 through May 2018. 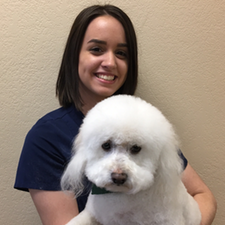 She just graduated from Wakeland High School in June 2018 and plans to attend BYU to major in Biochemistry and apply to Vet School from there. 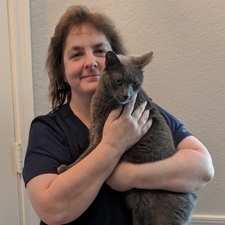 Syndi has earned her Level 1 CVT certification, and officially joined the AMSH team in June 2018. She has a Lhasa Apso named Daisy. 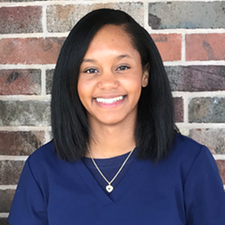 Amaya started in our intership program through Collin County College in the fall of 2016 and joined our AMSH family a year later. 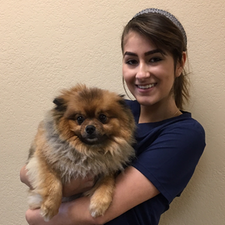 Amaya took small & large animal classes at the Career and Technology Center at Frisco ISD. 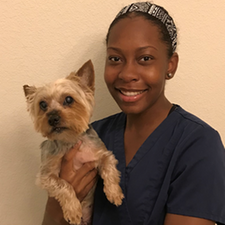 After successfully completing the course work, Amaya earned her Certified Veterinary Assistant certification in 2017. She will attend Howard Payne Universtiy in the fall where she will major in Biology while playing Volleyball. Amaya has a 10 year old Yorkie named Hezekiah whom she truly adores. Rachel joined The AMSH team in March 2016. She is currently attending Collin County College to pursue a degree in Education. She has three furry friends at home. A Shiba Inu, Kadee, a cat named Nala , and recently adopted a bunny named Bentley. When Rachael is not at work she enjoys playing with her pets and hanging out with friends. Maegan has been a part of the AMSH family since 2012. She went through the vet assistant program in high school and graduated with a CVA. 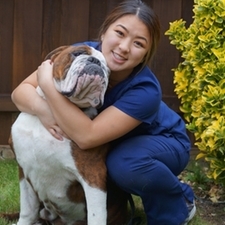 She has been working as a veterinary technician ever since. 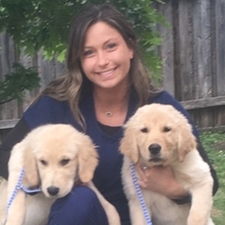 Prior to starting her career at AMSH, Maegan worked in emergency medicine. Meagan is currently attending Tarleton State where she is pursuing her teaching degree. Meagan aspires to teach high school agriculture. In her spare time she enjoys competing in hunter/jumper events with her horses Simon and Rush and spending time with her lab Hershel. 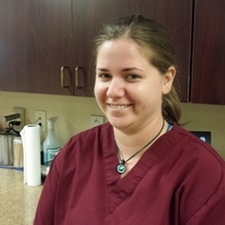 Addison joined the AMSH staff in 2015 after interning with the clinic for a year. She is currently attending Oklahoma State University pursuing a Bachelor's Degree in Animal Science, with a minor in Spanish. 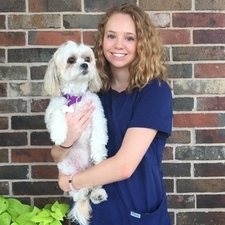 Addison hopes to attend veterinary school once she finishes her studies at OSU. She has experience with small animals as well as cattle and horses. Addison has one labradoodle named Nala and enjoys riding horses and being outdoors. Addison will be working during the summers and holiday breaks from school.